1. What is a CPA? Certified Public Accountants are licensed by each individual state to provide accounting, auditing, and tax services to the general public. They must pass the uniform CPA exam and have experience in public accounting in order to be certified. They must also meet continuing professional education requirements in order to retain their license. CPAs are authorized to represent taxpayers before the IRS. Some CPAs specialize in taxes and others do not. CPAs may work in an accounting firm or may have their own individual practice. 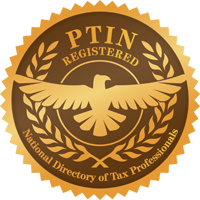 Certified Public Accountants do not need to obtain a PTIN unless they prepare for compensation all or substantially all of a federal tax return or claim for refund. 2. Are All Accountants CPAs? No. All CPAs are accountants, but not all accountants are CPAs. CPA is the abbreviation for Certified Public Accountant. The principal differences between accountants and CPAs are education and experience. In order to become a CPA, there are education and experience requirements needed to be fulfilled. In addition, a uniform CPA exam must be passed. A Certified Public Accountant is a tax professional who helps individuals, businesses, and other organizations plan and reach their financial goals. Generally, accountants prepare and examine financial records. They ensure that financial records are accurate and that taxes are paid properly and on time. They prepare tax returns. Accountants assess financial operations and work to help ensure that organizations run efficiently. 3. What is an Enrolled Agent? Enrolled agents (EAs) must pass a tax exam given by the IRS and are authorized to represent taxpayers before the IRS. They may be former IRS agents who are qualified as enrolled agents based on their past service and technical experience. Enrolled Agents have passed a three-part, comprehensive IRS exam covering individual and business returns. They must adhere to ethical standards and complete 72 hours of continuing education courses every three years. Enrolled Agents have unlimited practice rights before the IRS, which means they can represent taxpayers for any tax matter. 4. What is a Tax Attorney? 5. Can All Attorneys Prepare Returns? Yes. All attorneys can prepare tax returns provided that they are in good standing with the IRS and have registered annually for their PTIN. 6. Who Can Prepare Tax Returns? Many taxpayers ask who can prepare tax returns. The answer is that anyone can prepare tax returns for free. However, not everyone can prepare tax returns for compensation. All paid tax preparers must be registered with the IRS to prepare federal tax returns. Beginning January 1, 2011, a Preparer Tax Identification Number (PTIN) must be obtained by all tax return preparers, as well as enrolled agents who are compensated for preparing, or assisting in the preparation of, all or substantially all of any U.S. federal tax return, claim for refund, or generally most other tax form submitted to the IRS. A paid preparer must have a Preparer Tax Identification Number issued by the IRS for the return to be accepted by the IRS. Generally, how you decide depends on your own personal preference. Factors to consider are: how complicated your return is, how qualified you feel you are to prepare your own return, who has done your tax return in the past, and whether you have any significant changes this year. If you prefer to use a paid preparer, you also have several options that you should carefully evaluate. There are a number of different types of paid preparers, who possess different levels of qualifications and capabilities, offering different types of services. Their prices will also vary considerably. Certain individuals have the qualifications necessary to represent taxpayers before the IRS, but many paid tax preparers do not. The more complicated your tax situation, the more expertise you need to look for. If in addition to having your tax return prepared, you are also looking for tax advice, or tax planning, you will need to find a person qualified to provide that service. Your primary concern should be to find a tax preparer who knows taxes, is up-to-date on the latest changes in tax laws, and who is knowledgeable and experienced in your particular needs. You should ask about the preparer’s overall experience, and about experience in the area that concerns you, whether it involves itemized deductions, job related expenses, capital gains, income and expenses from rental properties, income from self-employment or a small business, or any other area.